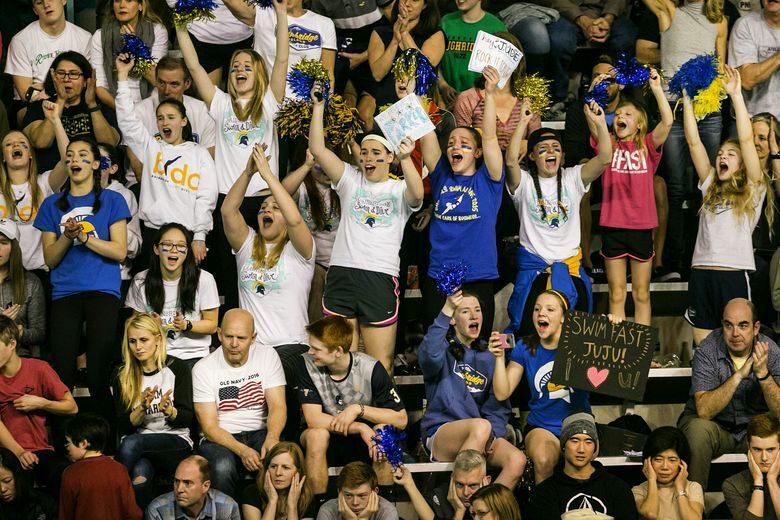 With Bellevue and Bainbridge exchanging leads throughout the meet at King County Aquatic Center in Federal Way, the Class 3A state title wasn’t decided until the end — when it went to Bainbridge for the first time. It was evident early that the quest for the Class 3A boys team title in swimming and diving was going to go down to the wire. 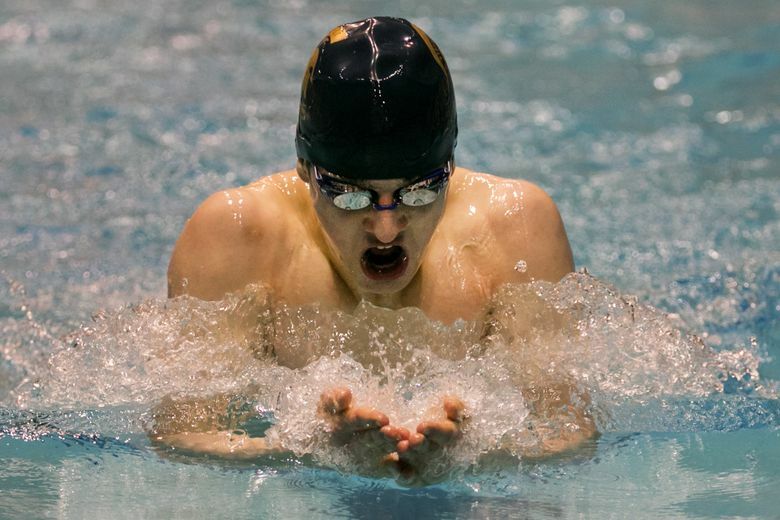 With Bellevue and Bainbridge exchanging leads throughout the meet at King County Aquatic Center in Federal Way, the state title wasn’t decided until the end — when it went to Bainbridge for the first time. The Spartans finished first, fourth and seventh in the 100-yard breaststroke, the second-to-last event of the meet, and put an exclamation point on the victory with an All-American and state-meet record time (3 minutes, 5.57 seconds) in the 400 freestyle relay as the Spartans defeated two-time defending champion Bellevue 369-351 Saturday night. Bellevue and Bainbridge combined to win every event at the meet except diving and the 100 backstroke. Bainbridge again got off to a fast start. About 24 hours after setting a state record in the 200 medley-relay prelims, the Spartans set another top mark with a time of 1:32.64 in the first event of the meet — barely edging Bellevue (1:32.95), which posted the second-fastest time ever in the event. 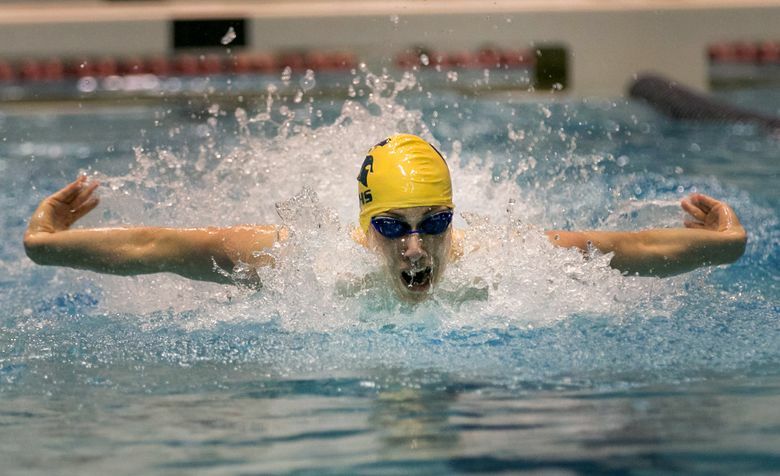 Bellevue took its first lead after the next event when Andrew Boden won the 200 freestyle for the Wolverines and the battle was on. 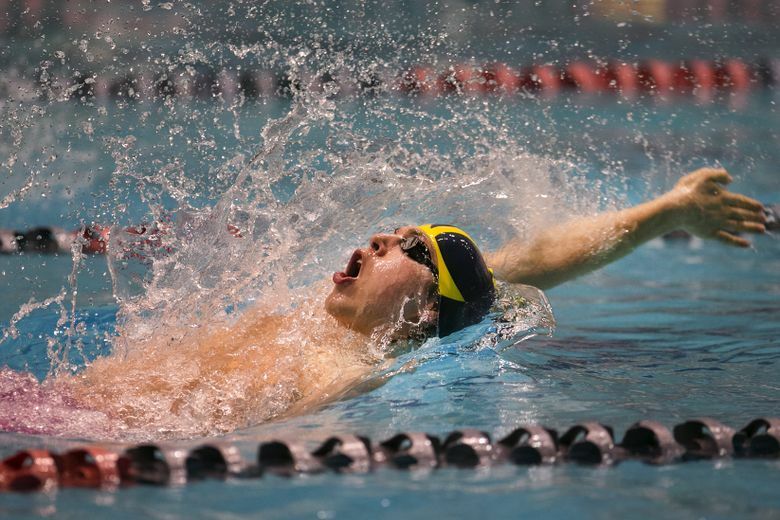 Bainbridge sophomore Makai Ingalls, who was named the WISCA Swimmer of the Meet, edged Bellevue’s Nathan Shao to win the state title in the 50 freestyle with a time of 21.06. Ingalls added a state title in the 100 butterfly (49.94), just beating Bellevue’s Sebastian Steen (50.13) to the wall. 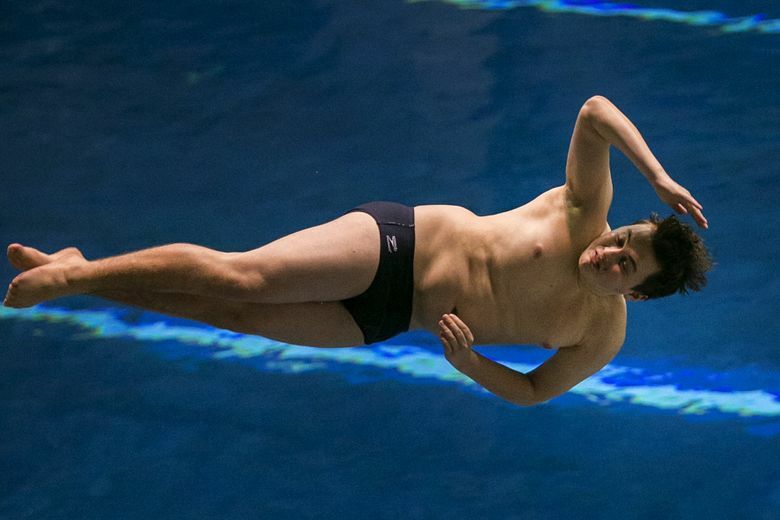 Jude Wenker won the closest race of the night when the freshman from Bainbridge won the state title in the 100 freestyle (46.96) by .02 over Shorewood’s Andrew Butcher to give the Spartans a 16-point lead. 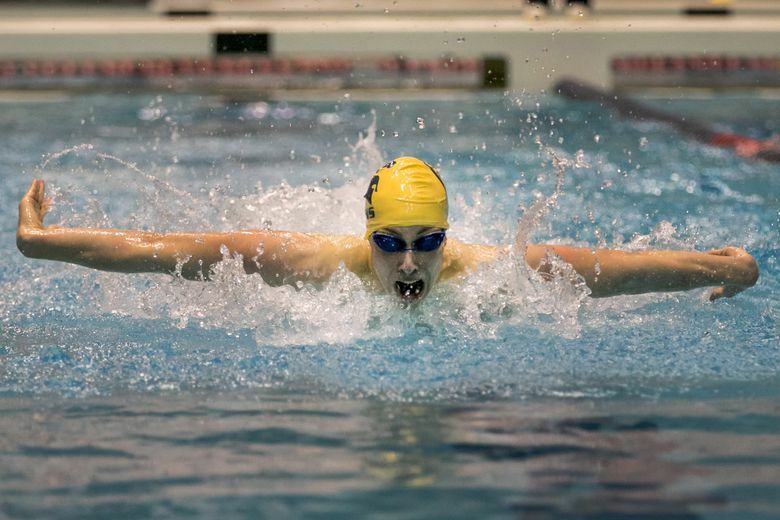 But Bellevue’s Boden and Jackson Dudley finished first and second, respectively, in the 500 freestyle championship and then overtook Bainbridge with an All-American consideration time of 1:25.52 in the 200 free relay. Bainbridge’s Kevin Houseman won the second-to-last event of the meet, with the sophomore winning the 100 breaststroke in 55.22. The Spartans finished first, fourth and seventh to retake the lead 329-317 heading into the final event, where Bainbridge’s relay team made sure everyone at the pool knew who the new state champion was. 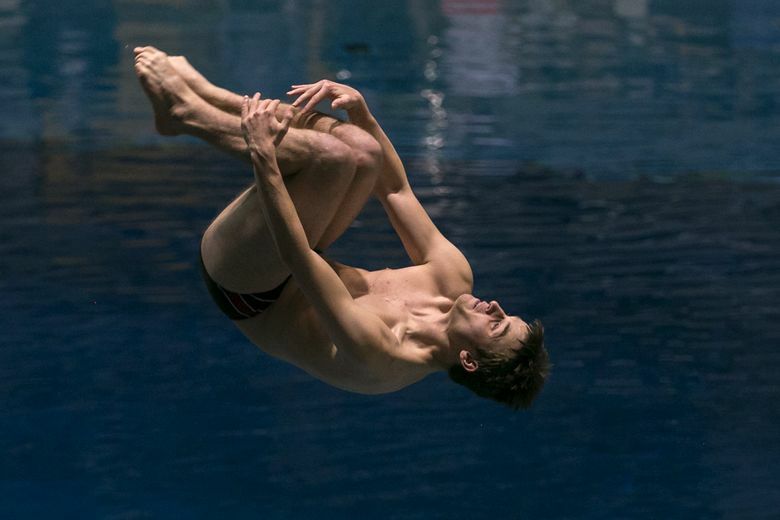 • Mercer Island senior Benjamin Dixon, who held a slim .10 lead after Friday’s semifinal round of diving, held on to win the state title with a score of 404.40. • Senior Emmett Wayte of Roosevelt won the 100 backstroke state title with an All-American consideration time of 50.29. • Mike McCloskey, the coach for Bishop Blanchet, was named the WISCA coach of the year at the meet.